Interests:Ice Hockey, figuring out how to build a quality instrument with my crappy excuse for a workshop. So, I am pretty much set to start (finish) my tele project. I have all the parts for it but I am still in the process of getting all my templates and such together. I am also trying to get all the right tools together. Since I will be building my own neck I decided that I wanted a fret bender, but I wasnt prepared to spend $80 on the Stewmac one so... I noticed that LMI had a $5 plan for a fret bender in their catolog so I added it to my already huge order of 2 truss rod nuts. Anyway, the plan is pretty basic and if I had really looked at the Stewmac catolog I could have figured it out but it did help. Anyway, below is a parts list and hopefully some pics. Here it goes. So, once you have all the parts together it really just comes down to drilling a few holes in your base material and assembling. One hole needs to be elongated to allw you to reposition one wheel to adjust the bend radius. I used 1/4" acrylic for the base which worked well. The plan called for aluminum but I had the acrylic. 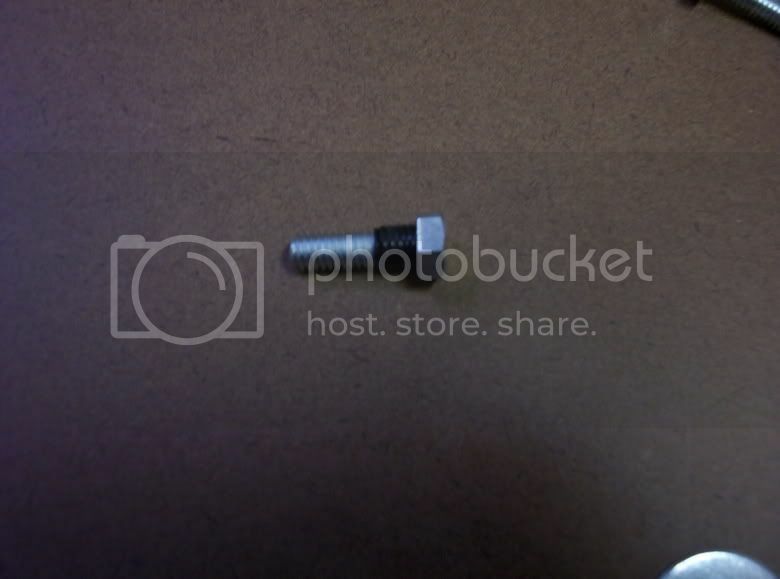 You could probably use just about anything but you will need to adjust the length of the three bolts. I found the roller wheels and the crank about 6" from each other in the isle with the door knobs and such. I also applied some lubricant on the top bolt and net to help things turn better. Thats really it, pretty simple and works really well IMO. 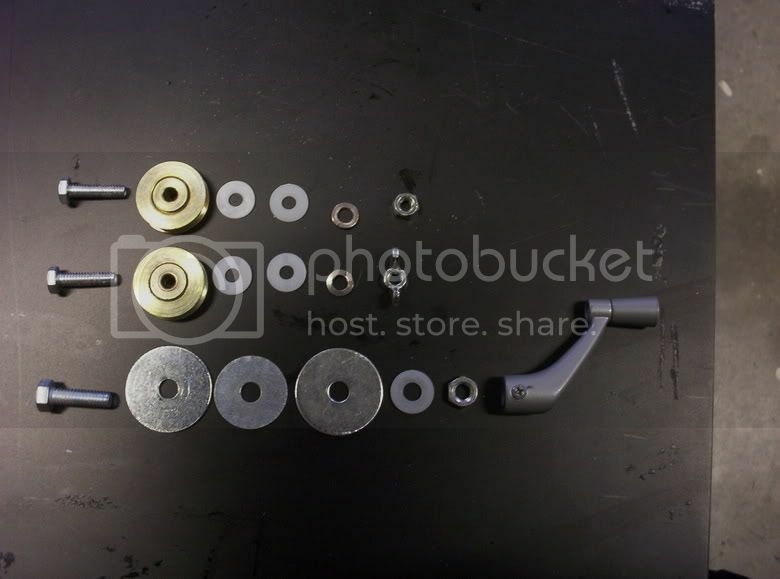 This picture shows all the parts and the order in which they should go together. 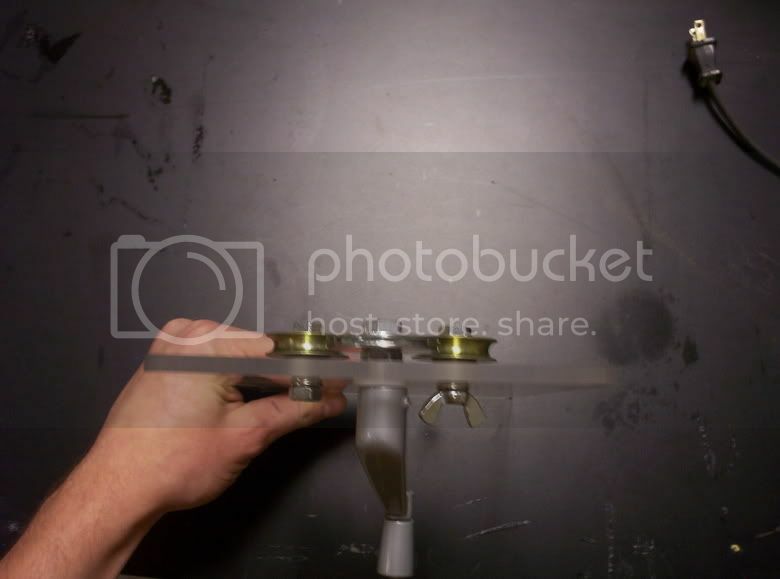 The acrylic goes between the 2nd plastic washer and the lock nut for the top two wheels and between the crank and the nut on the bottom one. 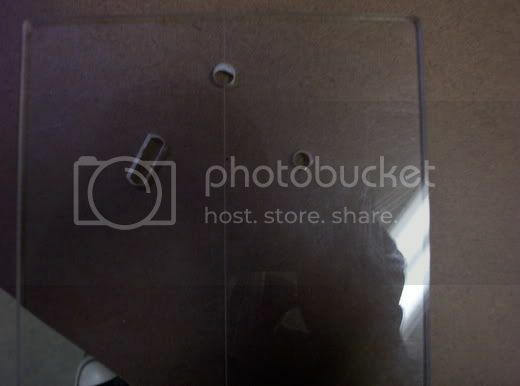 Here is the acrylic with the holes drilled and the adjustment slot for the wheel. THe top hole is 5/16" to match the 5/16" nut and the bottom holes are 1/4". This is a back view where you can see the wing nut used to adjust the wheel's position for a different radius. This is a crappy shot from the top but it shows the grooves in the 2 brass wheels to accept the fret. You can barely makeout the groove created by the undersized middle fender washer for the fret tang. I used the plastic washers as spacers to align the grooves in the brass wheels with the crank wheel. The number of ones you use will/can vary depend on their thickness. I wrapped a little electrical tape around the 5/16" nut. The fender washers have a 5/16" hole but even then there is a tiny amount of play in them. Doing this made all three lign up correctly so the wheel would turn true. The diagram is a few posts down. Good luck! What was the triangle lengths per side? nice work by the way. I was planning on making one but i have been bussy with robotics. Sorry i missed the part u buying the plans so you dont need to give the plans away, unless you wouldnt mind. Good job on the roller though. 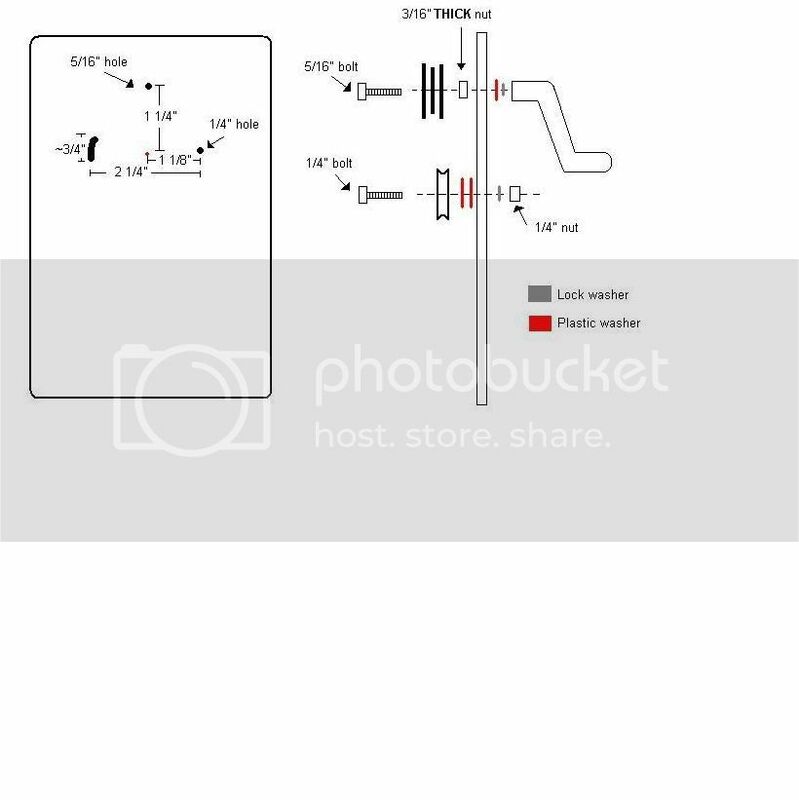 I am going to try to make up a diagram with the measurements. Ill have it up tonight. If I understand things correctly, the three fender washers are stacked to create a grooved wheel? Exactly, it gives the fret tang room and keeps the fret wire straight. Ok, so here is a rough sketch I did to show the dimensions and the order everything goes together a little better. The size of your base isnt important but mine was about 7.5" tall by 6" wide. Also, my hole placement puts the crank 1/4" higher than what the plans call for. I had to adjust it because the lower wheels in the plan were only 1" in diameter whereas mine were 1 1/4". I think that the ones they intended you to use were smaller plastic ones but I figured for $2 more I would go with the brass ones instead. Also is a link where you can see 2 pieces of wire I bent. I overbent them slightly for a 12" radius fretboard. The movable wheel was just a tad above the middle of the slot so you should have plenty of play either way to adjust for different radii (sp ). Sorry if this is an annoyance, but the elongated hole, what are the specs. Is it supposed to be straight up and down. If its curved, what are the spects on the curve. I curved it slightly. Its actually really just at a slight angle. I dont think it really matters though. I have seen them straight up and down before in pictures. All you really need is a way to raise and lower one wheel. In hindsight it actually would have been easier for me to do a straight hole. This is quite similar to what I made - got the idea from Kathy Matsushita's (sp?) site. I didn't put a crank on mine, the fret wire feeds through easily enough once I put a starting bend in it. I did make mine with a slotted middle pulley setup so I can adjust it to different radius boards. You're the man. It's like you've been reading my mind. I've been just looking through the stewmac catalog and saying to my self " I can make that way cheaper". Thanks for doing the homework and posting your excellent results. Hey jay, have you determined yet if there is a way to know where to set the adjustable wheel for whatever particular radius you want ? Or have you just had to experiment with some scrap pieces of fret wire until you get the proper radius ? I guess you could mark the position of the adjustable wheel on the base somehow when you get it set to a particular radius and then the next time you need that radius, you wouldn't have to fiddle with it again to get it right. Fender, that was my main reason in buying the plan from LMI. I was hoping it were going to have some sort of gauge but it didnt. What I did was draw out a 12" radius on paper and then start bending with the adjustable wheel at the lowest position. I kept moving it up slightly and comparing to my drawing until I was just under a 12" radius. With the lock nut once you tighten things down you dont really need to worry about it moving. I was thinking about marking it down but Im not really too worried about it. I figure the important thing is that you slightly overbend your wire for your desired radius. With the 3/4" adjustment hole I cut, which was slightly longer than what the plan called for I figure you can get inside the typical 20" to 7.5" radius range easily. I went out and bought the parts and in an hour I had me a fret bender! Next up building the fret arbor! How would you figure out so it was be the correct Radius when you are bending it? Nice work my friend! Im glad to actually see that someone was able to put this to use. I too bought a few extra washers because I wasnt sure what was going to need to be shimmed to allow everything to line up. Again, looks great! Thanks Jay. It appears the 5/16" hole I drilled leaves a little play for the bolt/handle. Does this matter? If so, I thought I'd wrap some silicon tape (plumber's pipe thread tape) around the bolt to snug it up. I'll be using this immediately since my neck needs to be fretted. I just need an arbor. Hmmm, I dont see why there should be play. 5/16" bolt+5/16 hole=should work. You could probably take up the space with plumbers tape. I know mine fit almost perfect. How much play do you have? I think as long as the top wheel isnt moving up and down while you crank it you should be ok. If it did it would give you an inconsistant bend on your piece of wire. I will tell you a few things that I ran into with that top wheel crank assembly. First off, once I bolted the three washers in place I chucked the thing into my drill press and filed it slightly so that the two larger washers were even with eachother and spun true. I also was having trouble getting the cranf to sit straight on the back. I noticed that the base of it where the bolt fits in wasnt square. I filled it down a bit so it would fit flush. Finally, I used a silicone lubricant spray I had lying around to lube up the hole, bolt and washers. These three things made a WORLD of difference. I was able to get everything bolted up nice and tight and turn really smoothly. Now that I think about it, your problem might be the length of the top bolt. I would go and snag a new one the correct length. This way you could eliminate all those plastic washers. That might have somthing to do with it. Those cranks arent heavy per say but they do have some mass to them. The crank might be pulling back a bit and causing things to have a little movement (if that makes any sense). 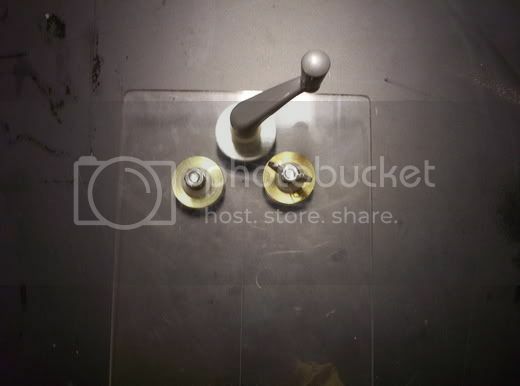 I think if you can get the crank right up to the acrylic with one washer between them, use some lube and get everything tightened and aligned just right you should be able to get rid of that play. Wow, that was a long response to a simple question. I hope you can pull somthing usefull from that mess. Let us know how it works! Thanks for the help Jay! I don't know why I have a little "teetering". I think it's because of all the washers too. I used a 5/16" Forstner bit to drill that hole. I'm going to try a shorter bolt and lose the washers. Do you have washers under your handle? Do you have washers under your handle? I have one plastic one. My drawing also shows a lock washer there, but thats wrong, just one plastic washer. It keeps the metal crank from scraping the acrylic. jay5, thanks for the great fret bender, I just made one and it only cost me 5 dollars, have a friend who works at Home Depo, but it is a really good idea! Thanks! Sorry i know this post is old, but I jst have one question that mabye someone could help me wth....How does the middle wheel (the one that you turn with the crank) grip the tang of the fret to pull it through? The friction/pressure from the wire being wedged between the three wheels is all that is needed to pull the wire through.